How to get there: The approach is the same as to Mount Lindsey. See the description under this mountain. Route description: This is a direct route from the large meadow just south of the Lily Lake trailhead. Follow the Lily Lake trail across the meadow, then as it crosses a small creek, start an ascending traverse up to the right (west). This steep climb will cross a distinct ridge that comes down from the mountain. Do not follow the creek up the drainage north of this ridge. The terrain is grass and fine gravel with scattered trees. Try to reach the ridge crest approximately at the horizon. From here, the steepness eases and you will see the next horizon higher up. There is a small creek, possibly dry, that comes down south of the ridge you are on, (to your left). Locate the small saddle above at the horizon from where this creek originates. Leave the ridge while climbing very gently and head up on the right side of this creek. The terrain is steep, but not difficult with grass and a couple of short sections of rock. Leave the last trees behind and finish this climb up a nice grassy slope to a small lake named Lost Lake. You are now in a beautiful basin with California to your north. From here, there are two fairly obvious routes. One can head up this basin on grassy slopes, then climb to the low point of the saddle straight ahead. From here one can follow a ridge (to the right) up to the summit. We took another route which will be described here. Head up the basin on grass, but arc right and do not gain more elevation that needed to stay on the grass. The route shall climb the long ridge that comes down from California on the right (north) side of the basin you are in. There is a fairly wide gully that cuts down from the ridge just at the upper side of the talus slope that falls down along the ridge to the very north side of the basin you are in. This gully or cut is the key to ascending the ridge in a safe and easy manner. In order to reach its base you must cross a short section of talus. There is a faint trail crossing fairly horizontally, try to locate it as it makes the crossing very easy. Once at the base of the gully, ascend it for example along the upper (left) side directly to easier ground and then proceed to the top of the ridge. There is a small cairn there to make it easier to locate the return route. Follow the ridge all the way to the summit. This is easy hiking with a mix of stable rocks and grass. The last part of the ridge is fairly level after merging with the ridge that comes in from the saddle at the upper part of the Lost Lake basin. Comments: I did this climb with Arnt Flatmo. We started at 0600 and reached the summit after 2:45 at 0845. The view is very good, the Sand Dunes and the Crestones to the north, Blanca, Ellingwood and Little Bear in the opposite direction, Lindsey further east and the minor summits with interconnecting ridges all around. We started the descent at 0900 and returned to camp around 1030. 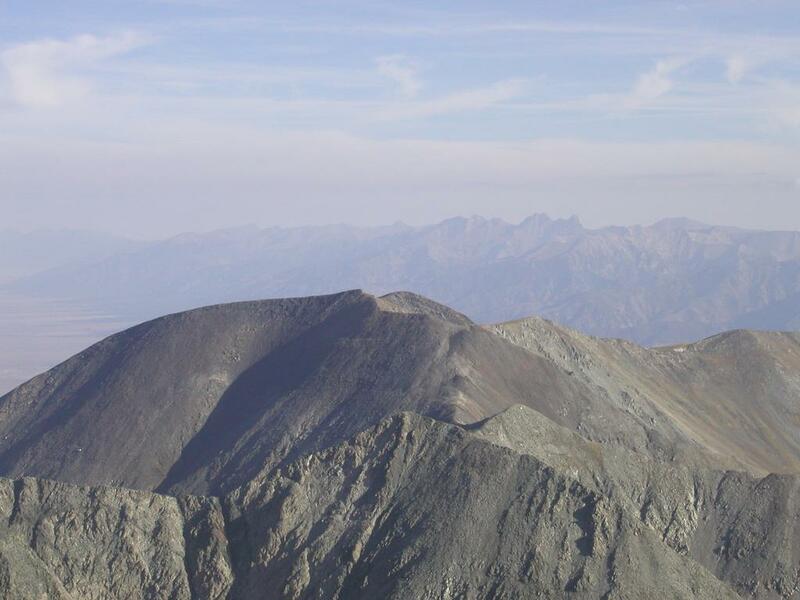 California Peak , as seen from the summit of Blanca Peak.